Bankers , Brokers, Bubbles and Bailout is aimed at activists, students, workers—anyone interested in helping our towns, states, and nations construct and economy that is more equitable for everyone. Our method builds on a popular education framework, where we connect to the experience and expertise of participants so they can become more engaged as potential activists. In the workshop, participants review the trends and events that created the housing bubble and the financial meltdown, and explore the impact of the crisis on their jobs, families and communities. Together they identify strategies and individual actions they can take to help build a broad-based, inclusive, democratic social movement that will create a more equitable economy. UFE's Racial Wealth Divide workshop helps explore how our current economic inequality has been and continues to be shaped by racialized policies and behavior from the past to the contemporary. The workshop focuses on the role of government policies and reveals how critically important it is for us to abolish racial wealth inequality and the society that creates and maintains it. Thus the workshop is a critical education tool that helps workshops participants understand why things are the way they are. The workshop also helps participants develop strategies, campaigns and actions that will help create greater economic equality and racial economic justice. UFE's tenth annual Martin Luther King, Jr. Day report, State of the Dream 2013: A Long Way From Home, outlines the state of the racial wealth divide in the U.S. and puts forward creative solutions for addressing persistent racial inequities. 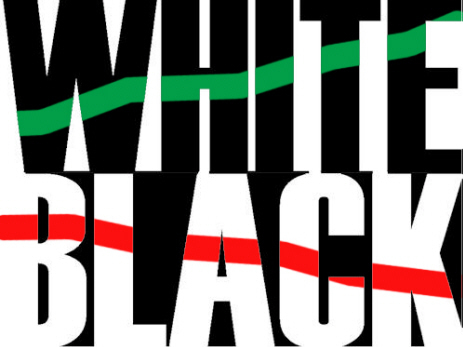 Black and Latino families continue to have far less wealth than White families and have emerged from the Great Recession more indebted and less able than White families to face the economic challenges before them. Housing, an integral piece of the increasingly elusive American Dream, has much to do with the hemmorhaging of wealth in communities of color. This report examines the link between housing and asset-building policies, the impacts of those policies on communities of color, and urges a targeted, goal-oriented policy approach that is guided by our shared values and principles. Fifty years ago this year, on the steps of the Lincoln Memorial, Martin Luther King, Jr. shared a vision for a future of equality for all people, regardless of race, in his "I Have a Dream" speech. He spent the final years of his life working with thousands of others to challenge economic inequality and racial injustice. Although their efforts made historic civil rights victories possible, much work remains to close the racial divide. We are, indeed, a long way from home. Read the report today. Share it with your community. Start a conversation. Speak out and work together to make a new economy possible. 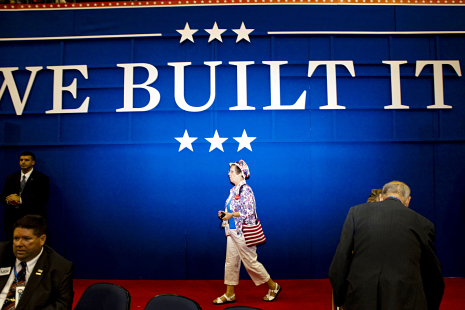 Hammering an out-of-context quote from President Obama, "We Built It" became the theme of last week's Republican National Convention. Virtually every speaker used the phrase, with sometimes misty-eyed stories of bootstrapping, "I did it alone" success (with no help from government). Signs featuring the phrase hung over the main stage and filled the convention center, boasting: We built it! We built it! We built it! Meanwhile, fact checkers, writers, and progressive organizations fired back, both recounting the full quote from President Obama (his "You didn't build that" comment was referring to the roads and infrastructure, not the businesses themselves) and making the case for why businesses do, in fact, depend heavily on public investments. This debate is only getting started. As NRP's Ron Elving wrote, "The central theme… in Tampa is about to become the party's mantra for the fall." So get used to a lot of talk about who actually built it, what they built, and why it matters. Looking beyond this one election, this is a critical debate about core values that shape our views on taxes and the role of government in our society. In March, months before Obama's statement in Virginia, we published a book entitled The Self-Made Myth: And the Truth About How Government Helps Individuals and Businesses Succeed. In it, we contrast the "self-made myth" with the "built-together reality." Little did we know when we came up with the term "built-together," that this would become a defining theme of this election cycle. The stories of business leaders tell a more honest and complete story of their success. Jerry Fiddler, founder of Wind River Systems (sold to Intel for $880M), talks about publicly-funded research and land-grand universities as key to his business success. Jim Sherblom, former CFO of the Genzyme, notes the importance of the SEC in providing a stable financial market. Kim Jordan, CEO of New Belgium Brewing, declares "beer is heavy" as she emphasized the importance of roads and transportation infrastructure in making her business possible. We also investigated people like the Koch Brothers who graze their cattle on federal land and use eminent domain law for their pipelines. We examine Donald Trump, whose father constructed FHA-guaranteed homes for US naval personnel, leaving the junior Trump with a sizable inheritance. 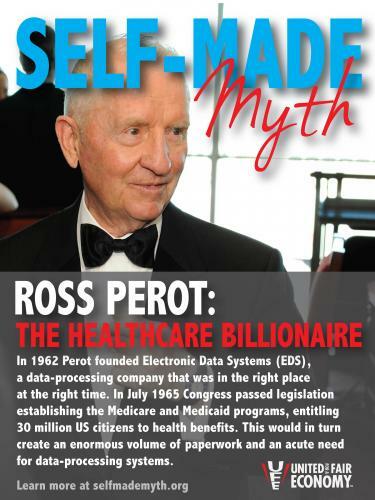 Similarly, Ross Perot's software business rode to success on the backs of the federal Medicare program. Governmental supports and public infrastructure are an important part of any success story in America, along with a bit of luck, various head starts in life, privilege, and the contributions of others, including the many employees (The AFL-CIO responded to last weeks convention theme with an email titled, "No, WE built it"). Such an honest and more rounded assessment helps put the "self-made" narrative in perspective. But that's not what we heard last week. We heard, "I built it," and from that bootstrapping narrative comes a host of policy implications. If they can convince us that the successful business leaders achieve their wealth through gumption and hard work alone, then extreme inequality is simply the result from their exceptional intelligence and hard work of those at the top …and the sloth of others. Efforts to rein in that inequality are thus viewed as "punishing success." Efforts of workers to demand a fair wage are viewed as "thuggary." Taken to its logical conclusion, this frame helps to fuel an anti-tax, anti-government, and anti-worker agenda. The business leaders we spoke with understand that their hard work was matched in many ways by the contributions of society, not to mention a good bit of luck. As such, they take a very different view on taxes and the role of government, actively speaking out for a strong estate tax and ending the Bush tax cuts for top income-earners. Many also insist on paying their workers fair wages, or even sharing ownership with their workers. In the weeks ahead, we have an opportunity to open a more meaningful discussion about the origins of individual and business success, and in doing so, shifting the public policy debates in positive ways. We sincerely hope our book, The Self-Made Myth, is a valuable contribution to this discussion. But we also need writers, bloggers, and organizers across the nation to pick up on this message. If we're going to create a new narrative, we'll need to "build it" together. The Trayvon Martin case illustrates that we still have a hard time dealing with issues of race in this country. 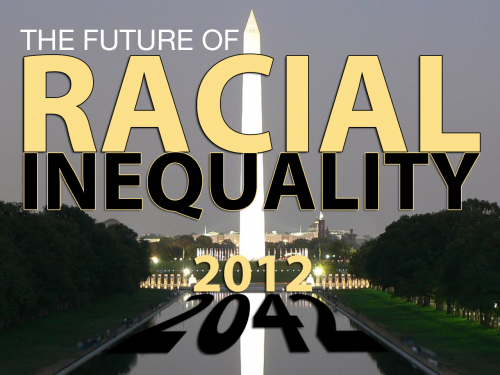 The issue of racial injustice, coupled with economic injustice, is not likely to fade away. The Census Bureau estimates that by 2042, the population will no longer be majority white. Many believe that this demographic shift will automatically bring with it a qualitative improvement in the situation for people of color. At the other end of the spectrum, there is a segment of white America that deeply fears the demographic changes and sees in them a threat to its status. Such fears lead some of these people to gravitate toward right-wing populism. 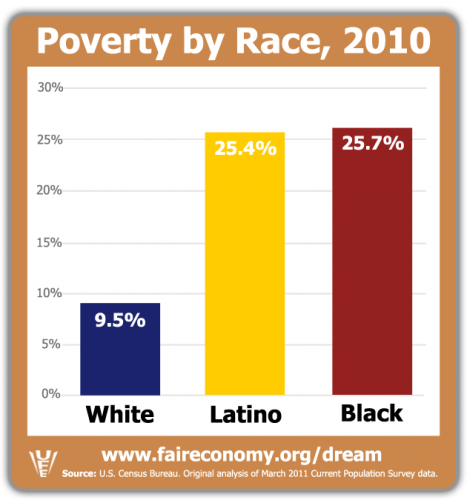 But the demographic changes are not expected to bring about any significant improvements for most people of color, particularly blacks and Latinos, according to a new study, State of the Dream 2012: The Emerging Majority, by the Boston-based United for a Fair Economy. If current trends continue, we will witness widening gaps in income and wealth, as well as in education and incarceration rates. The study predicts, for instance, that blacks will make 61 cents and Latinos will make 45 cents for every dollar whites make in terms of median family income. Contrary to right-wing populists' "dystopia for whites," the report paints a picture of a reconfigured Jim Crow — almost an apartheid situation of haves and have-nots. Most whites won't be benefiting, either. The overall living standard of most of this country, which began to decline in the mid-1970s, will continue to decline. The fates of poor and middle-class whites will be much more connected to those of people of color than to the very rich and largely white ruling elite. The implications of this report are sobering — even frightening. We need concerted political and economic action in the days and months and years ahead if we are to conquer our racial and economic disparities. That means not just continuing affirmative action. It also means launching policies of redistributive justice. Let's face it: Those at the top have been redistributing income and wealth their way over the past three decades. If we don't implement policies that redistribute income and wealth to the vast majority of Americans who need it, our country will become increasingly — and dangerously — divided. Bill Fletcher Jr. is a scholar with the Institute for Policy Studies and the co-author of "Solidarity Divided." He wrote this for Progressive Media Project. Black History Month may have come to an end, but the fight against racial injustice is hardly over. In order to close the racial economic divide, we must first take an honest look at the policies and practices that created and perpetuate racial disparities. Here are 11 ways federal government giveaways gave an economic headstart to white people while excluding people of color. White Revolutionary War veterans were given nine million acres of Indian land. In 1841, the U.S. government legalized squatting, allowing white settlers to take over Native American land. The U.S. Government helped enforce squatting by employing the U.S. Army out west to beat back Native Americans from land coveted by white settlers. In addition to conquering half of Mexico, the U.S. Government reclaimed Latino landowners’ land for minor infractions such as missing paperwork or back taxes, and then sold it to Anglo settlers at a minor cost. The Homestead Act of 1862 provided free or very inexpensive land was provided by the government to 1.5 million white families. Following the Civil War, freed slaves were promised ‘40 acres and a mule.’ Following Lincoln's death, this promise was revoked and land was returned to its previous White owners. Through the New Deal, the U.S. Government provided minimum wages, union rights, and social security to industrial workers, almost all of whom were white. These same benefits, however, were denied to agricultural and domestic workers, most of whom were people of color. Government-sponsored aid was provided to struggling white farmers while denying it to most black farmers from the 1930’s right through the 1980s. Provided free college education, vocational training, and cheap mortgages to nearly two million white WWII vets via the GI Bill, while simultaneously blocking most veterans of color from accessing the same benefits. Invested in infrastructure to expand suburban neighborhoods where white households were able to access government-subsidized mortgages while urban, inner-city neighborhoods were red-lined. Tax breaks on investment income (such as dividends, capital gains and inheritances), which are disproportionately owned by wealthy white people, have been cut and lowered much more than taxes on income from work. The "self-made man" is as American as a Norman Rockwell image. It is also just as overly romanticized and wholly separated from reality. Indeed, the notion that individual success is entirely autonomous has dangerous policy implications. 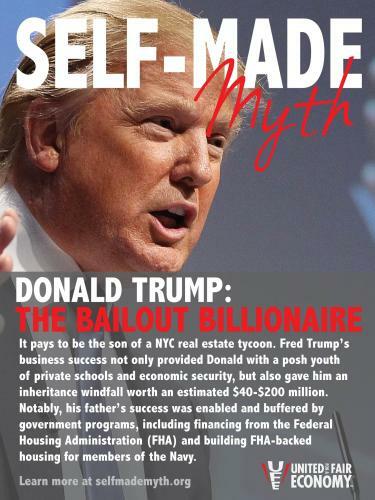 It's time to do some myth bustin' and put the "self-made myth" to rest, once and for all. UFE's new book, The Self-Made Myth, challenges the by-your-own-bootstraps myth by offering real stories of business and individual success. 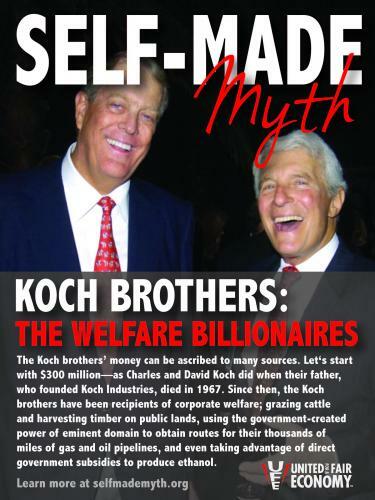 It also disproves the claims of several modern-day self-made business heros, including the familiar faces below. These silver-spooners have no qualms about bashing and starving government, even though Uncle Sam was (and continues to be) a key business partner in enabling their success. Take a look at the images below, save and share with your networks, and help us bust the self-made myth once and for all. Martin Luther King Jr. gave his life to the struggle for racial equality. The vast racial economic divide remains a fact of American life more than forty years after his assassination. Ratio to White: Black 6.1 times more likely to be in prison, Latino 1.5 times more likely to be in prison. Dr. King described the civil rights victories of the 1960s as having achieved “a degree of decency, not of equality.” Racial economic equality remains a disturbingly elusive and distant dream. 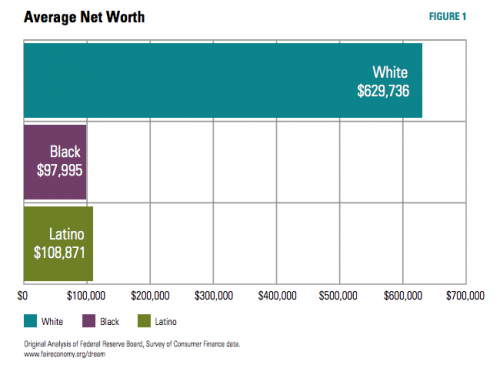 In wealth and incarceration, the Black White divide has worsened in the last thirty years. The economic situation for the average Latino family has deteriorated overall relative to Whites since 1980. Read our 2012 State of the Dream report, The Emerging Majority, for more details on how we got here and where we are headed. In the report, we look thirty years ahead to 2042 when the Census Bureau projects that people of color will become a majority of the population. We examine the trends in racial ineqaulity over the last thirty years, since the election of Ronald Reagain in 1980, and project those trends thirty years forward to 2042.